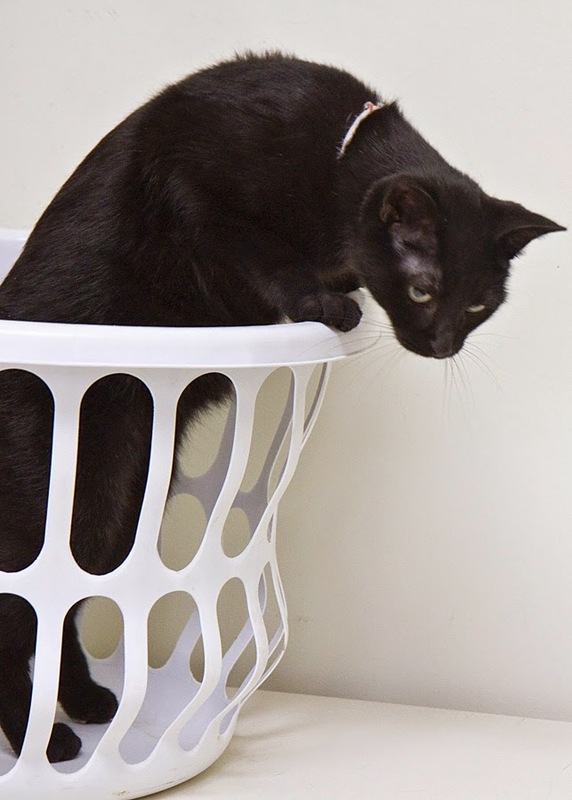 Today I am featuring 3 young cats who live together in a cattery with 3 other cats. They are all very friendly and playful, and they crave human attention, sometimes even asking for it vocally! They rub up against their cattery and meow loudly to get your attention, and of course you can't resist stopping to pet them a little bit! This first cat is Twizzler. She has been at the Noble County Humane Shelter since August. You can't see it real well in these pictures, but she is almost all black with a little white on her neck. She has had her shots, flea prevention, and is wormed, and she is FIV-negative. 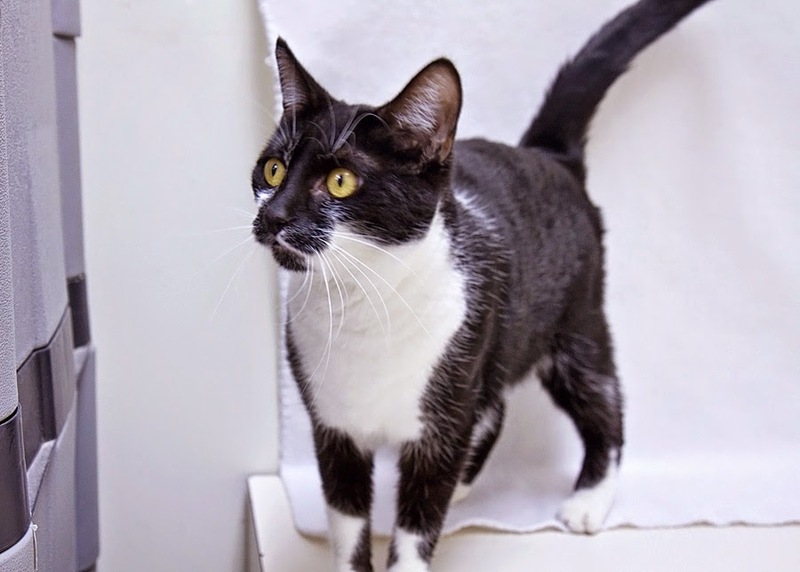 Twizzler lives in a cattery with 5 other cats, so she is easy to get along with. She loves people and attention, and as you can see from the second picture, she loves to play. Share this with your friends, and hopefully someone can give her a good home! Isn't she pretty?!! Cheyenne is 6-7 months old. 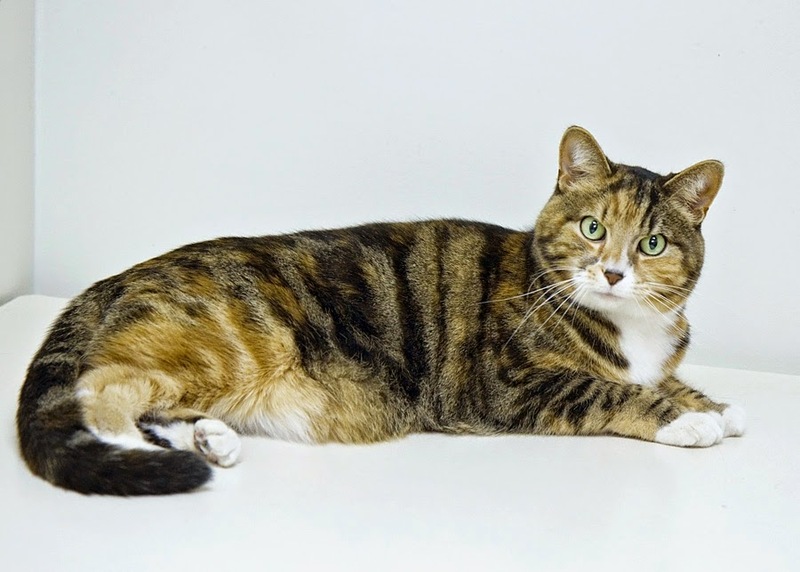 She is a black and tan tabby with a bullseye pattern. She is up-to-date on shots and flea prevention, has been wormed, and is FIV-negative. She has been at the Noble County Humane Shelter for almost 4 months. She was very interested in the clicking noises of the camera and the dangling shoulder strap, so it was easy to get pictures of her looking directly at me. She lives in a cattery with 5 other cats, including Twizzler, so she gets along well with other cats. She is also good at amusing herself with toys. Come visit her and you will fall in love! Today's final cat is Ruby. 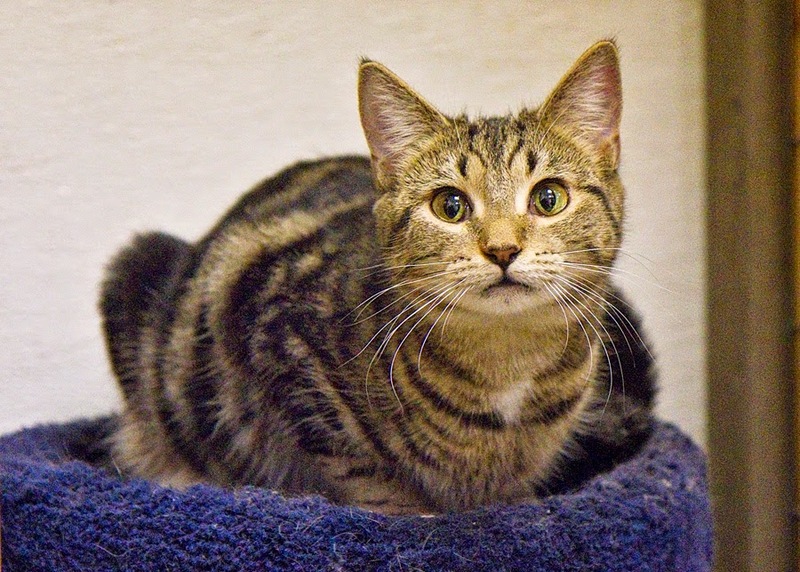 Ruby is a 4-5 month old female, who is a lighter colored tabby with a lot of tan and a little black. She has been wormed, is up-to-date on shots and flea prevention, and is FIV-negative. 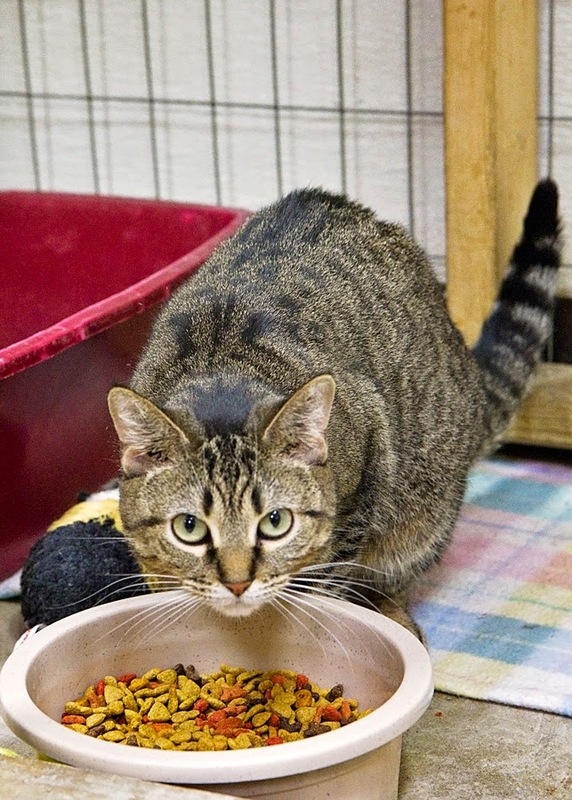 Ruby lives in the same cattery as Cheyenne, Twizzler, and 3 other cats. They are all super friendly and playful, and love to receive human attention. As you can see from the second photo, Ruby is easily entertained. 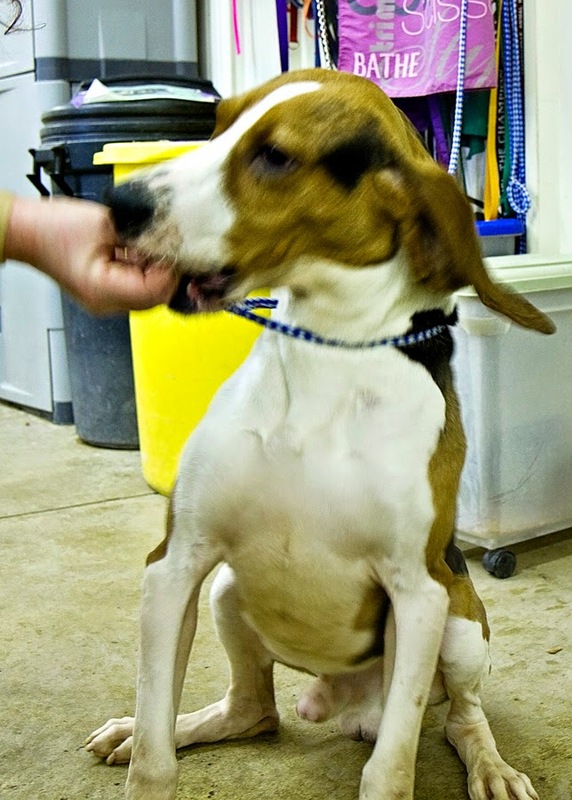 Come to the Noble County Humane Shelter and meet her! These cats and many other cats and dogs are waiting for you to come meet them. Please visit the Noble County Humane Shelter if you can give one of these pets a home!! 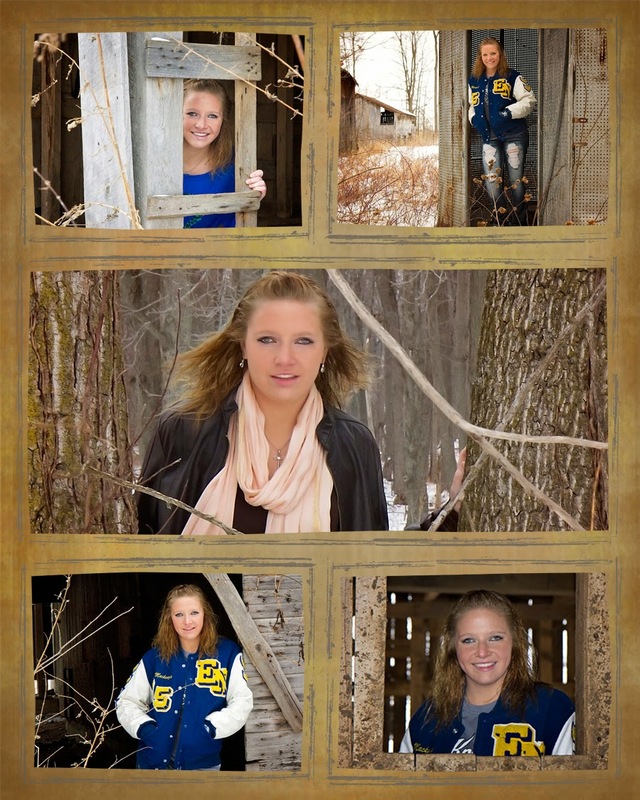 A lot of seniors - or anyone, for that matter - don't like to brave the cold and snow to get pictures taken. But snowy scenes are usually beautiful, and once in a while I find someone who's willing to try it. On this particular day, the temperature was probably around 22 and it was quite windy, as you can see from the way her hair is blowing in some of the images. I fell down once, tripping over a snow-covered root in the woods, and I practically buried my camera in the snow. My camera also protested the cold weather, as after about 40 minutes it started to respond very slowly. But all that aside, it turned about to be a great photo shoot. Here is a collage of some images that were processed in black and white with some shades of brown mixed in. 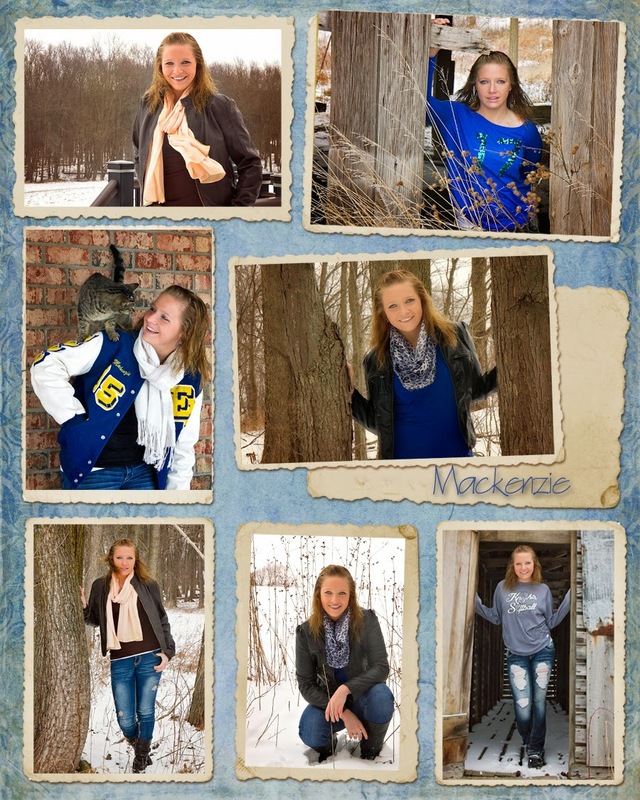 This young lady is having more pictures taken in the future - some sports pictures and some in the spring when the weather is hopefully a lot warmer. So be sure to check back for more pictures of her later. 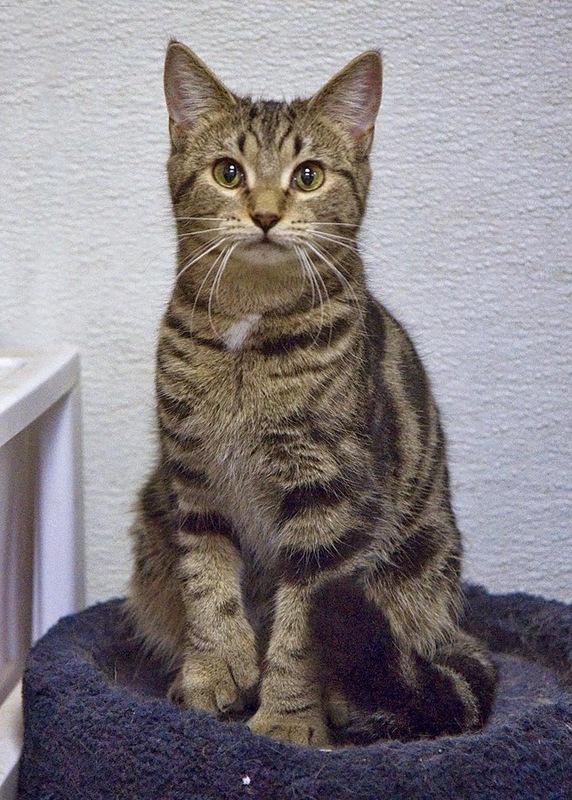 This girl is the newest cat at the Noble County Humane Shelter, arriving on January 26, 2015. She is a colorful tabby with a sad story. Maybe someone can give that story a happy ending. Check it out . . . This beautiful girl has been aptly named Precious. 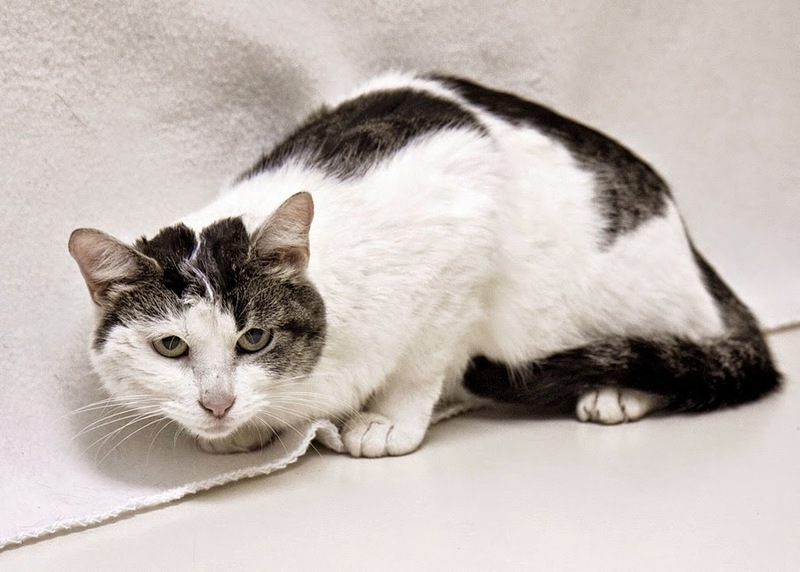 She is the newest cat at the Noble County Humane Shelter and is approximately 6 years old. She is an owner surrender, because unfortunately the other cats in the household picked on her a lot, and her owner didn't feel it was fair to her. She should probably be in a home where she is the only cat, because she has learned to distrust other cats. However, she has had excellent care. She is spayed, front and back declawed, up-to-date on shots and flea prevention, and has been wormed. She was very friendly when I got her out of her crate to take her picture, so I'm sure she would make a lovely pet. She really knows how to pose, doesn't she?!! Come see this gorgeous girl - maybe you could give her a forever home! Today, I am featuring a few of the many dogs that are available at the Humane Society of Noble County. This is Jethro. 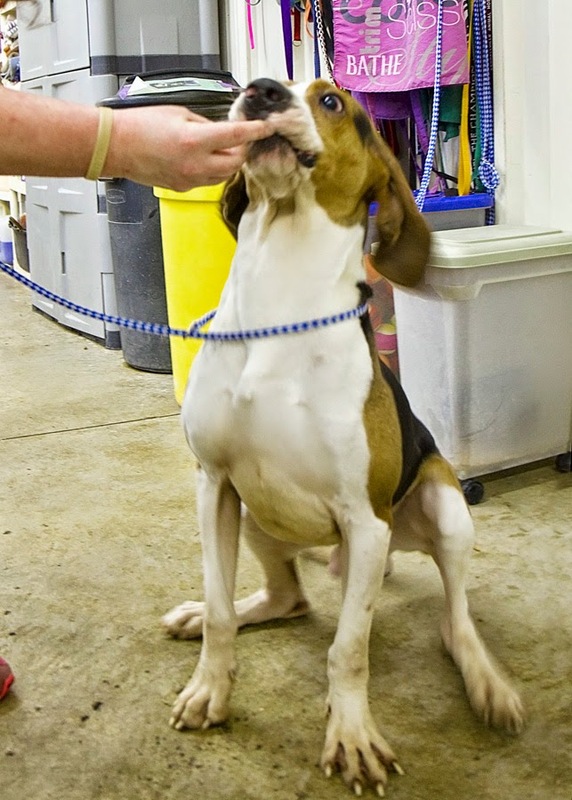 He is listed as a Treeing Walker Coonhound. He is 1-2 years old and weighs 45.3 pounds. He has his shots, kennel cough vaccination, and flea prevention, and has been wormed. He is heartworm-negative. He is an active boy, is driven by his nose, and can smell food and treats a mile away. The pictures are a little blurry because he wouldn't sit still long enough to get a clear picture! He is very intelligent, which should make his training easy. Come see him at the Noble County Humane Shelter. This beauty is Vida, a female retriever mix who is approximately 6 years old and weighs 44.2 pounds. She is microchipped, is up-to-date on shots, flea prevention, and kennel cough vaccination, and has been wormed. She is heart worm-negative. Vida is very calm, gentle, and friendly. She loves attention and cuddles, but will also play well with toys by herself. She has been at the Noble County Humane Shelter for a little over a month. Could you give her a forever home??? The last dog for today is Karma, a female pit bull mix who is approximately 3-4 years old and weighs 53 pounds. She is up-to-date on shots, flea prevention, and kennel cough vaccination, and has been wormed. She is heart worm-negative. 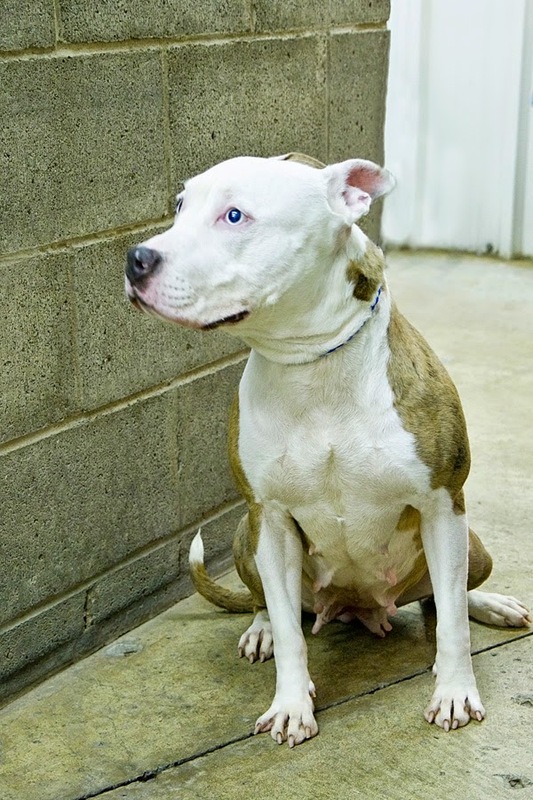 Karma has been at the Noble County Humane Shelter since early November. She is very gentle and obedient, but as you can see, she wasn't too excited about getting her picture taken. Come visit this sweet dog and think about taking her home. 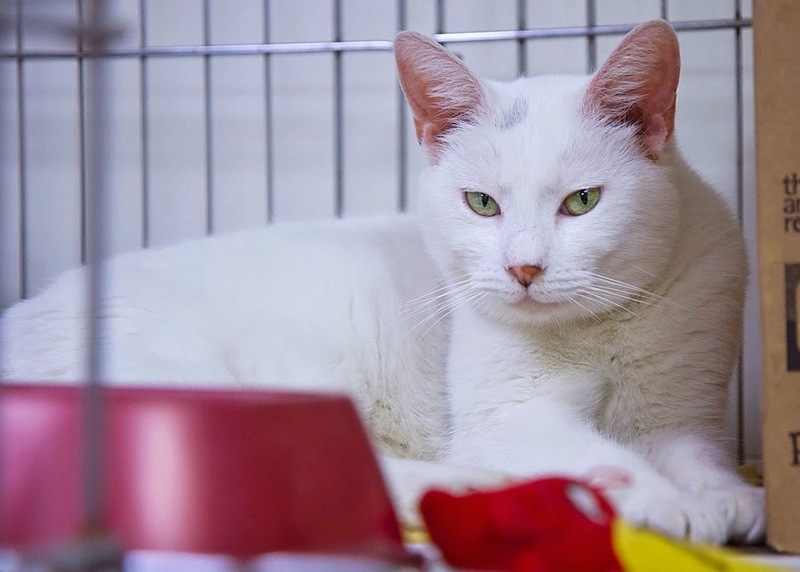 Today's featured cats from the Noble County Humane Shelter are a pair of big all-white boys. The first one with the blue eyes is Casper, and the second one with the green eyes is Olaf. They are both 2-4 years old, have been neutered and wormed, and are up-to-date on shots and flea prevention. They were both brought to the shelter on the same day about three months ago, so maybe they are brothers?? They share the same crate at the shelter, and they are both big love bugs. They would love to share your home with you! Aren't they handsome?? 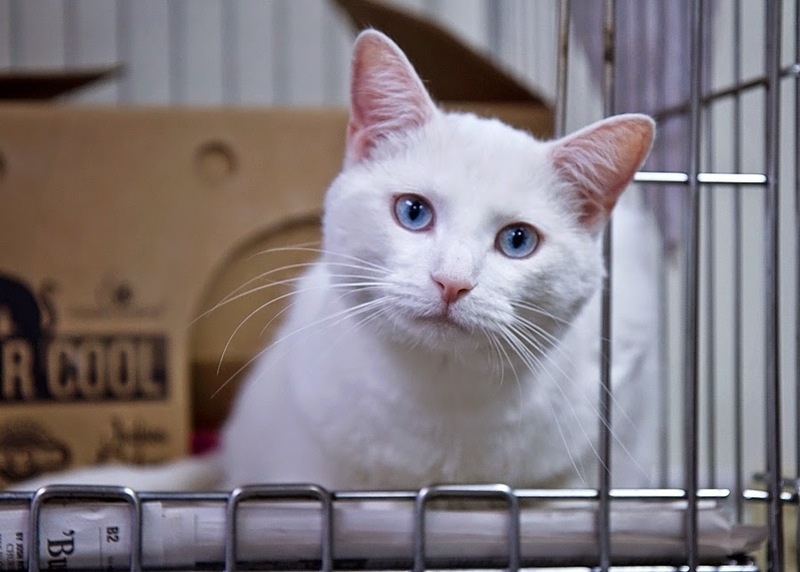 Many people believe that white cats with blue eyes are deaf, and although that might be true for some, it is definitely not true of Casper. These two are very affectionate and often cuddle together in their crate. They are available for adoption at the Humane Society of Noble County. 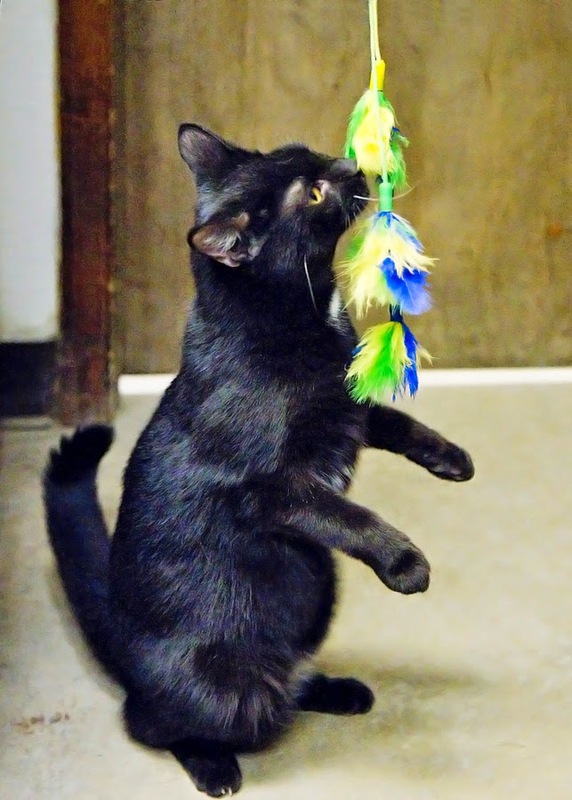 Here are a few more black cats which are available for adoption at the Humane Shelter of Noble County. The first two look a lot alike, and they look like several of the other black cats at the shelter. This is Cinderella. She is a 2-3-year-old female, who has been wormed, is up-to-date on flea prevention, and is FIV-negative. 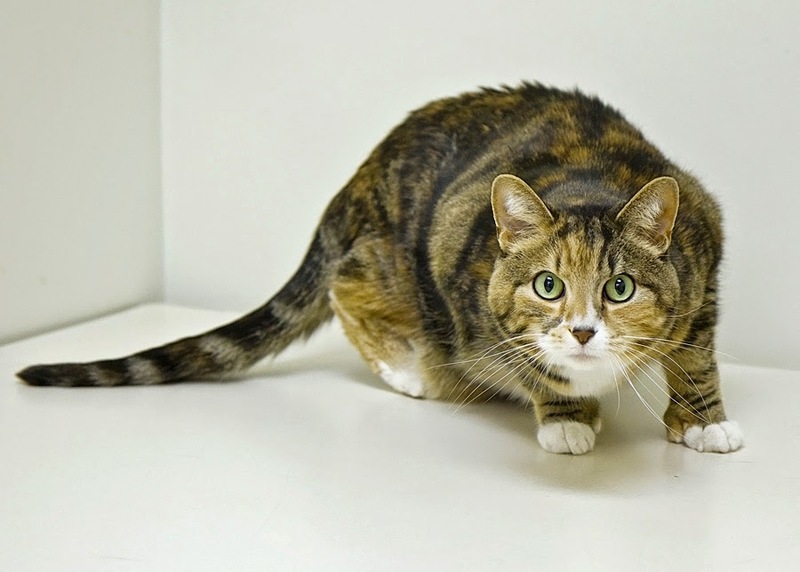 She is a medium-sized cat who gets along well with other cats, and loves human attention. She has been at the shelter since September. How can you resist those gorgeous eyes?!! Meet Nikky! She looks a lot like Cinderella, except Nikky has a few white hair around her chin and chest, which can sort of see in the picture. She is 3 years old, is up-to-date on shots and flea prevention, has been wormed, and is FIV-negative. She has been at the shelter for a little over 3 months. She is Cinderella live in the same cattery with 4 other cats, so they both get along well with other cats. Nikky is a friendly, loving girl, and would make an excellent pet! Just as there are special-needs children, there are also special-needs pets. These next two black cats are FIV-positive. That means each one needs to be the only cat in the home, or needs to be with other FIV-positive cats. These cats are just as loving as FIV-negative cats, and their condition is not a threat to people - only to FIV-negative cats. 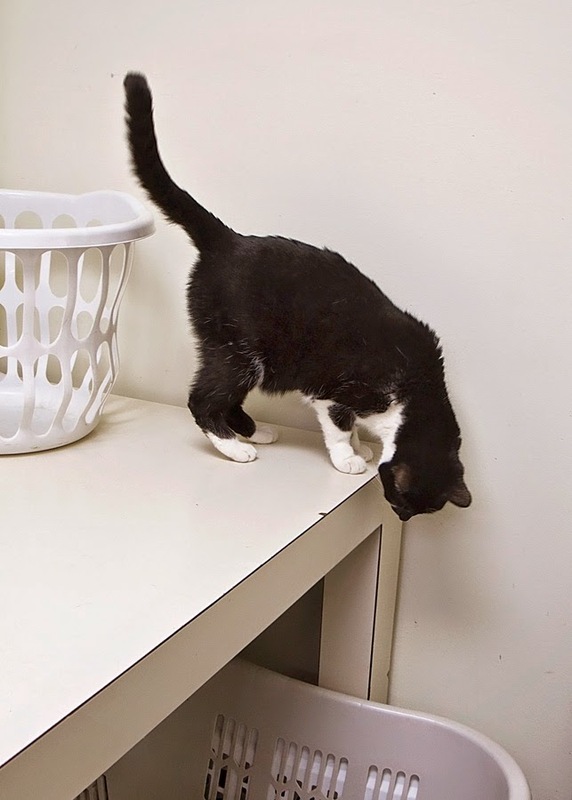 At the Noble County Humane Shelter, FIV-positive cats can be adopted for FREE!! 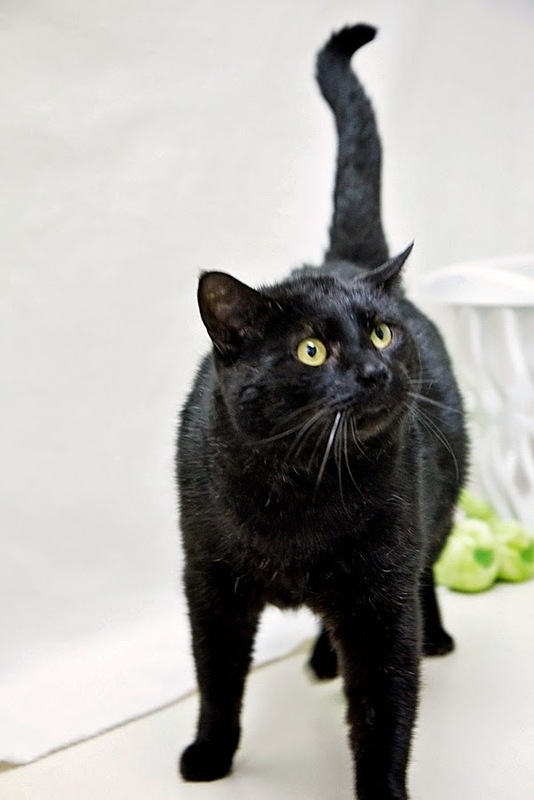 This first guy is Black Jack, a neutered male approximately 3-4 years old. He is up-to-date on shots and flea prevention, and he has been wormed. He has been at the shelter for about 6 months. Since he is FIV-positive, he is FREE! He was born with one deformed ear and got the other ear partly chopped off, so he is a little goofy looking, but he is very curious and lovable. He was little afraid of the camera! This second big guy is Zion, a neutered male who weighs about 16 1/2 pounds! He has been wormed and is up-to-date on shots and flea prevention. He has been at the shelter for about 7 months. He is also FREE to adopt! He’s a real sweetheart, but wasn’t too excited about getting his picture taken either. Even though these two are FIV-positive, they would be no more "trouble" than an FIV-negative cat. They are both very affectionate, and just need someone to take them home and love them! Please visit the Humane Society of Noble County to check out these cats and many other cats and dogs. All of these animals deserve to have loving homes, and they want little else! 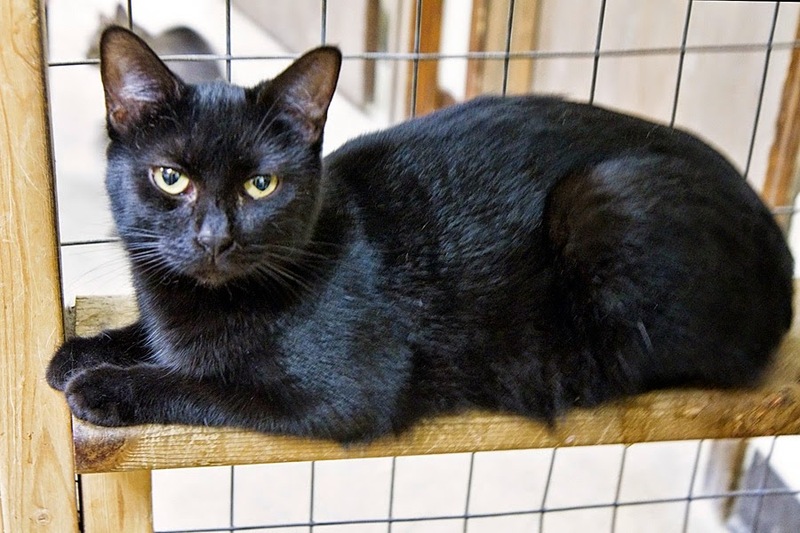 For some reason, black cats are not adopted as readily as other cats. 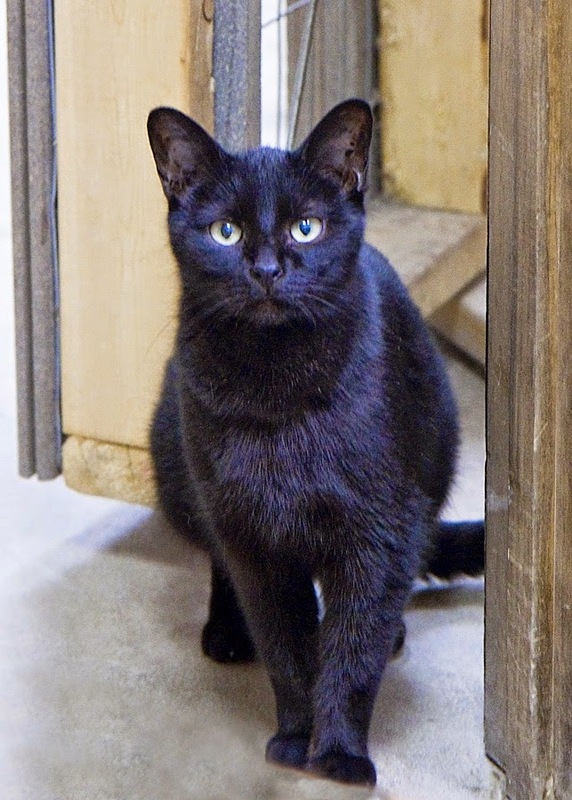 It is probably because of the silly superstition that black cats bring bad luck. Also, some people associate black cats with evil, maybe because of the way they have been portrayed in stories and movies. 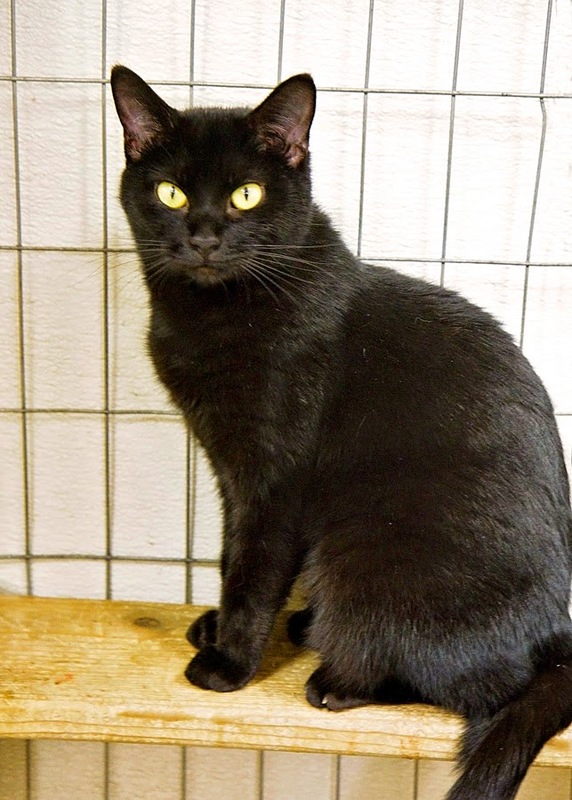 There are many black cats at the Noble County Humane Shelter and they are all cute, friendly, and affectionate. Please consider giving one or more of these cats a lot of good luck by adopting them and giving them a forever home! The first two pictures are of Dante. 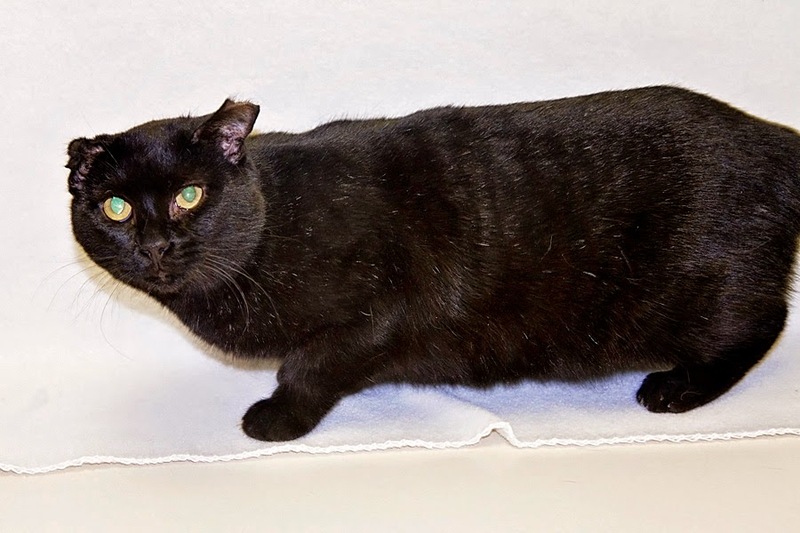 He is an all-black 2 1/2-year-old neutered male who has been at the shelter for almost a year and a half. He is up-to-date on shots and flea prevention, has been wormed, and is FIV negative. 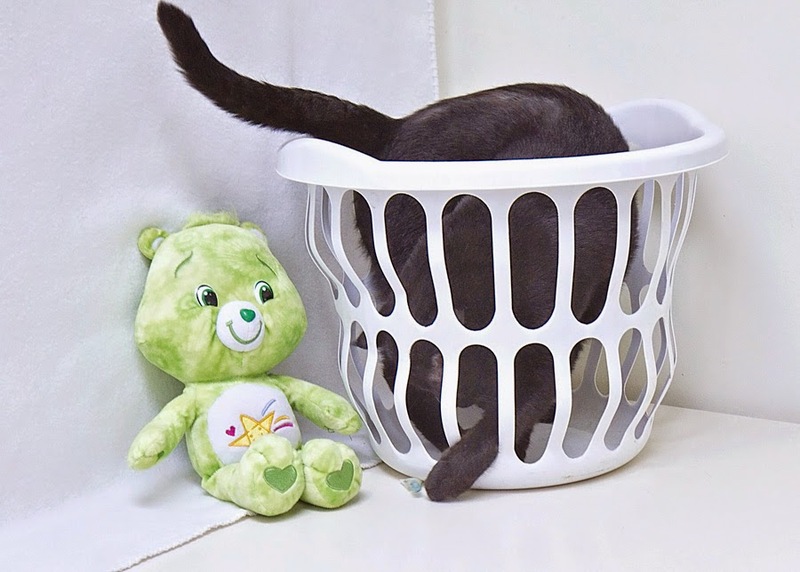 As you can see, he loves to get in things such as this laundry basket. He is an Alpha cat and it would probably be best if he was the only cat in the family. He is very sweet around people. and is up-to-date on worming, shots, and flea prevention. She is curious and likes to explore, but she also likes attention from humans! The last 2 pictures are of Piper. She is a small black beauty who has been wormed and is up-to-date on shots and flea prevention. She is also FIV-negative. She is around 2 years old and has been at the shelter for just a little less than 2 years. 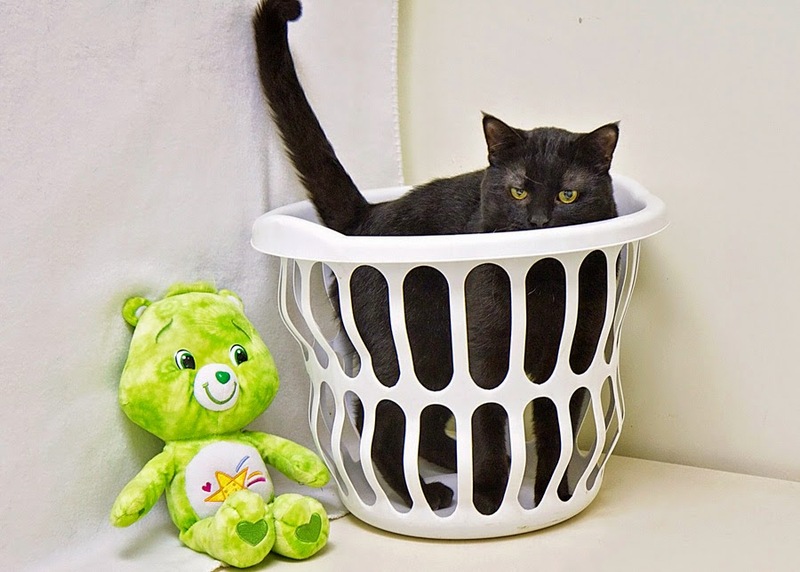 She likes the laundry basket too, and would love for someone to give her a happy home. Please consider visiting the Noble County Humane Shelter to visit with these cats and see many other gorgeous cats and dogs who are there! 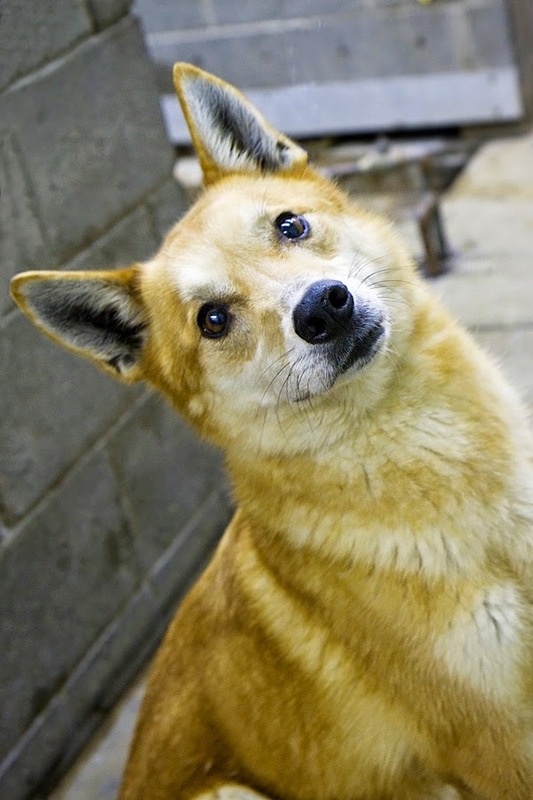 I have been volunteering at the Humane Shelter of Noble County, and one of the things I offered to do was take pictures of adoptable animals and post them on Facebook and on my website. The shelter is currently home to about 25 dogs and over 125 cats! If you or anyone you know is looking for a pet, please consider coming in to the shelter to see all the gorgeous animals they have. Every few days I will be posting pictures and information about some of the animals who are waiting for their forever homes. 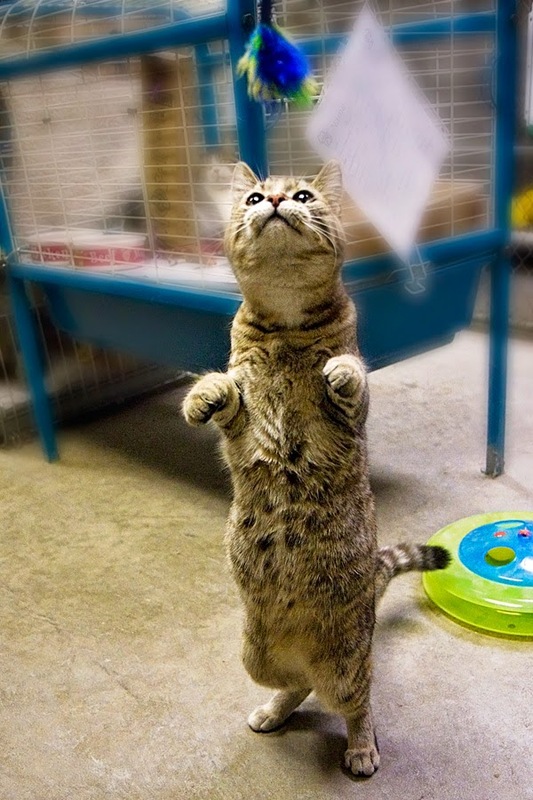 I will start with a few cats who have been at the shelter for a long time. 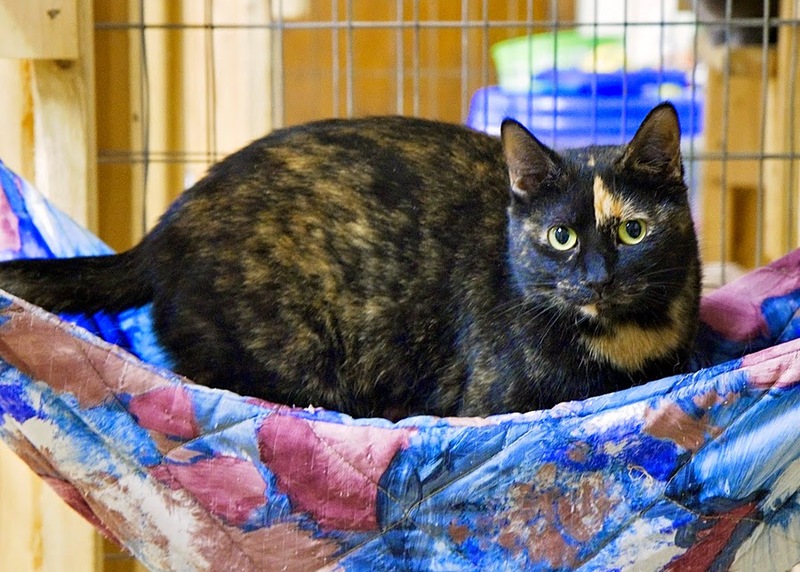 This is Princess, a gorgeous female tortie. 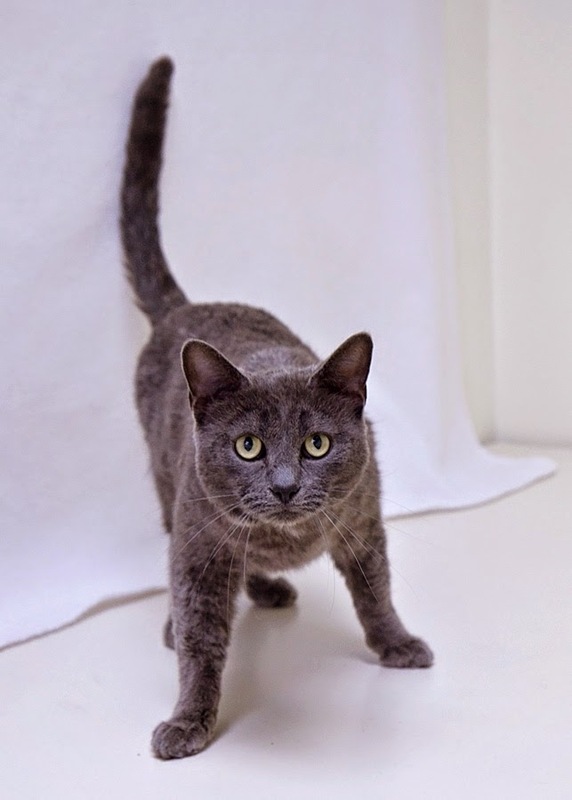 She is 3 years old and has been at the Noble County Humane Shelter longer than any other cat. Princess has been spayed and wormed, and is up-to-date on shots and flea prevention. She also tested FIV-negative. I can't imagine why no one has adopted her because she is so affectionate and pretty. Come in and see her, and consider taking this love bug home! This kitty is Vivien. 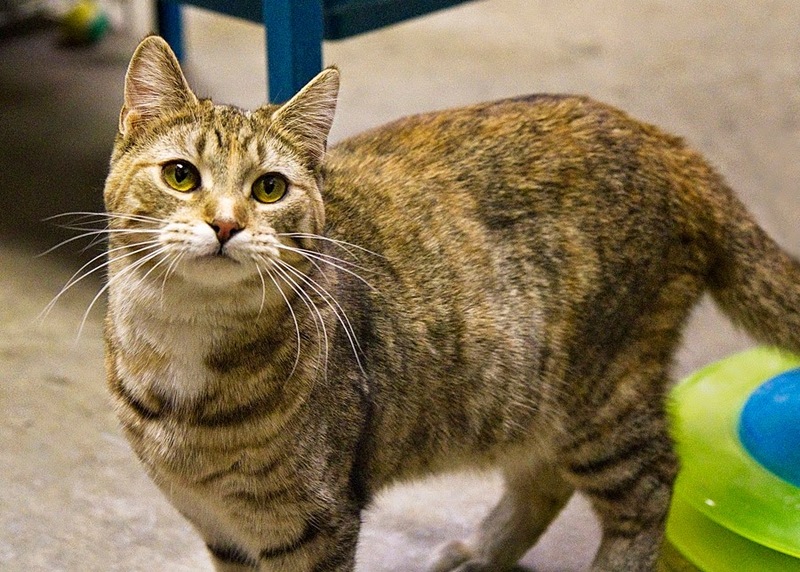 She is a tan tabby around 2 years old who has been at the shelter for 2 years! She is spayed and wormed, up-to-date on shots and flea prevention, and is FIV-negative. She is very friendly and trusting and would love for someone to take her home! 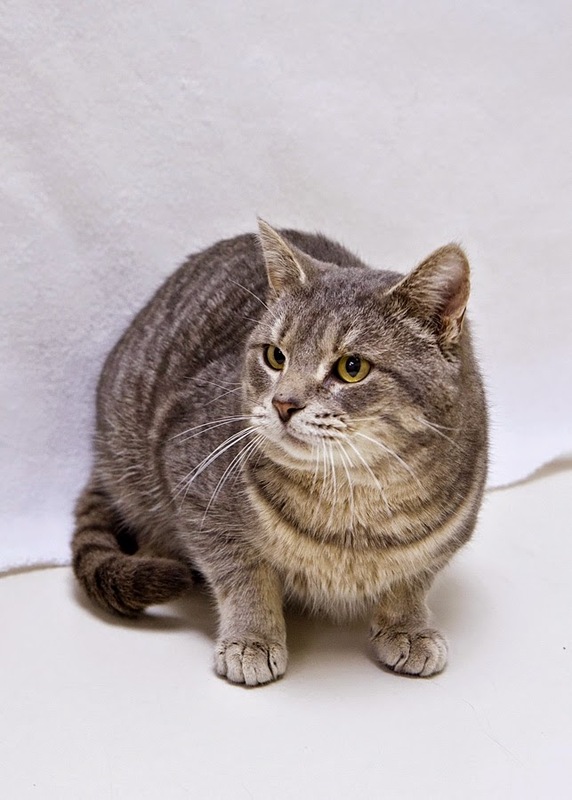 Here is another wonderful cat from the Noble County Humane Shelter. She is Tinker, a long-haired black and white beauty. She is 2 years old, and has been at the shelter for most of her life. She has been wormed, is up-to-date on shots and flea prevention, and is FIV negative. Tinker is playful and loves to roll around on the floor. 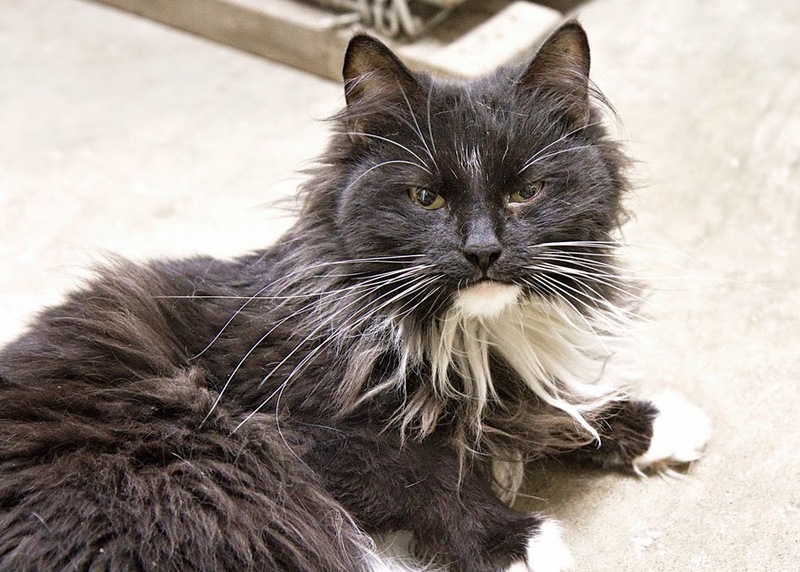 She is very friendly and likes to be brushed to keep her long fur looking beautiful. Please consider giving her a forever home! 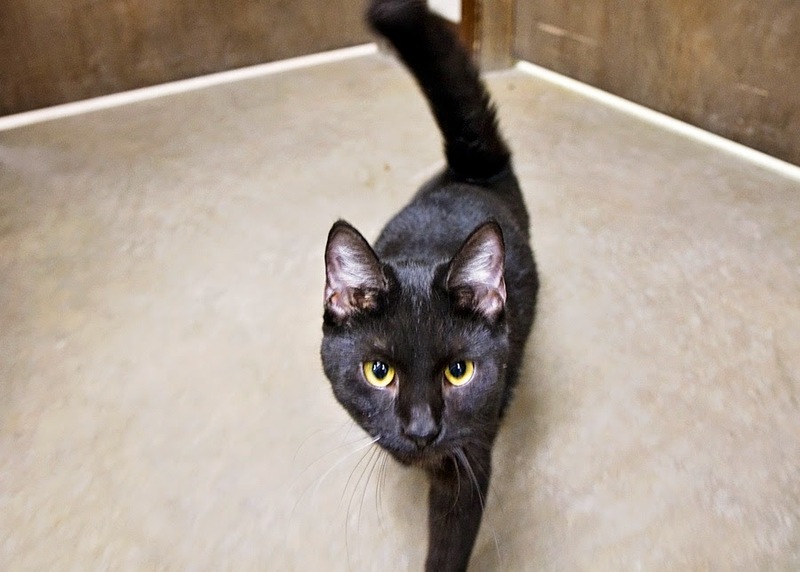 This handsome male cat at the Noble County Humane Shelter is Sherman. 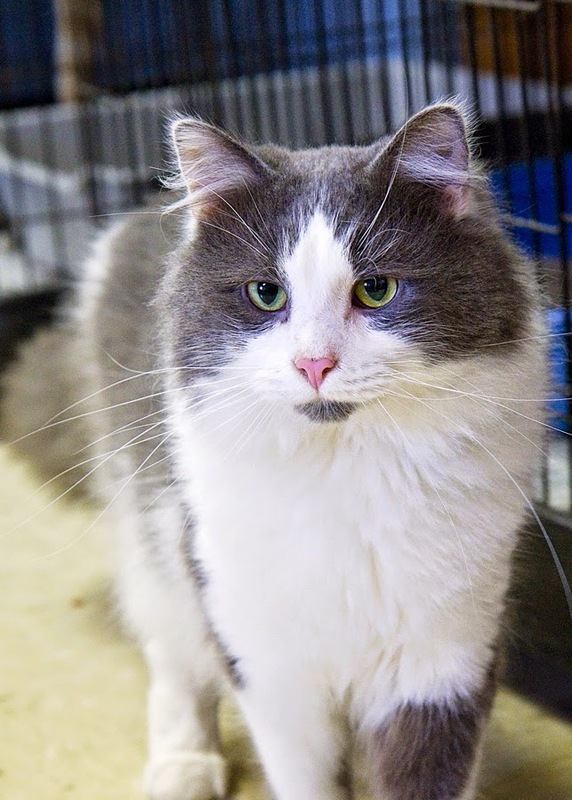 He is a big gray and white boy and is just short of a year old, and has been at the shelter for most of his life. He has been neutered and wormed, has flea prevention, and is FIV-negative. He loves to be petted or held and brushed. He would make a very good cuddler. Please come in and see him and take him home! These next three are cats that have just arrived at the shelter in the past couple of days, so I don't have much information about them yet. This is Pebbles. She is still a little shy and is getting used to being around the other cats and strange people. (Meaning that the people are strangers to her, not that they are strange!} :) I think she will be really affectionate when she gets used to things! She is an average-sized cat, so I would guess she is full-grown, but I'm not sure how old she is. This is Bam-Bam. Either he is not quite full-grown or he is going to be a small cat. He seemed friendly and wanted attention. He also liked to explore. This is Barney. He seemed to be an average-sized cat also. He was a little shy, but loving. I think he would make a great pet. There are so many beautiful animals at the shelter that I hope you could find it in your heart to adopt one (or more) of them. All they want is a warm home, some food, and lots of love!